Part one of choosing a wedding veil is the length - once you've done that, you'll want to move on to deciding what you want on your veil. Of course, there are a ton of options! Let's go through some of the most popular to help you decide which look suits your bridal style the most. Who doesn’t love a little pizzazz and fun? 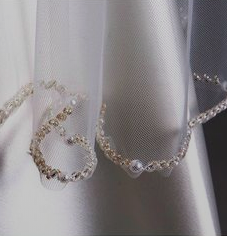 The beaded veil can feature sequin, crystals, rhinestones or pearls on the hem of the veil or scattered throughout. Definitely adds more glamour and drama to your look. Like the embellishment on a beaded veil, lace can either decorate the hem of a veil or sprinkle its soft romantic feel all over. Don't hesitate to ask your consultant if you can order extra lace from your dress to decorate your veil with! Lace truly adds more romance and it's a softer way to elevate the level of detail to your look. Simple, sweet and to the point. A raw edge plain veil is as minimalist as it gets. 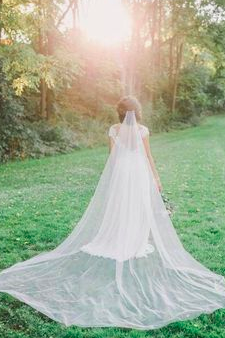 This veil is simply made of tulle with zero embellishment or detail. 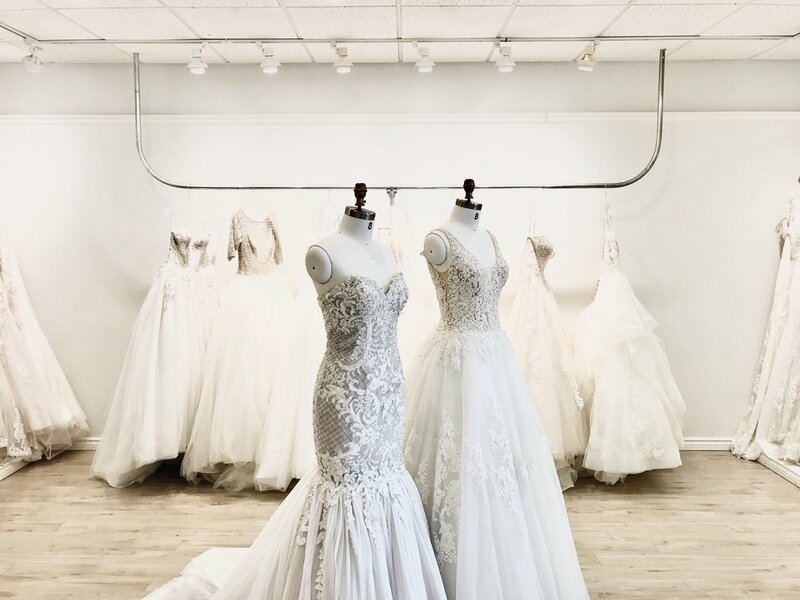 Typically if your wedding dress already has a lot of glitz and glamour this is a great option that won't interfere with everything that's going. Also perfect for those brides looking for a simple option for a simple dress. A satin or silk hem can jazz up what would otherwise be a raw edge veil. The soft detail provides elegant touches for the brides who want a little more while remaining simple. For the brides who love their drama in volume, a 2 or 3 tiered veil is the way to go. These layered beauties can be pulled over the face to act as part blusher can be worn all to the back to provide texture and drama.